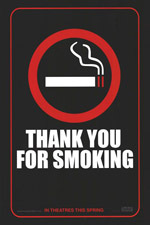 What did you think of Thank You For Smoking? If you met Nick Naylor, you probably wouldn’t like him. He’s arrogant, successful, handsome, and is well aware of it all. Fortunately, you don’t have to interact with Nick Naylor; you can watch him with other people. After all, movie goers like watching arrogant, successful, handsome men as long as said men are doing cool things and saying witty things. I mean, how much fun could it be hanging around with James Bond? He is a walking, talking reminder of how cool you’re not. I digress; the point is, Nick Naylor is one of these guys, and he’s fun to watch for similar reasons. Nick’s downfall is that he works for Big Tobacco, not MI6. He lobbies to keep people smoking, convincing people that it’s cool, and all the while tries to convince the people in his life that he is a good person. No easy task for a man who defends the death of 1,200 people a day. Nick Naylor is played by Aaron Eckhart, who’s most notable previous role is perhaps that of Erin Brockovich’s biker-neighbor/boyfriend, George (also played well in my view). This role is a much different one, but played with the same heart and conviction. As usual, the acting hinges largely on the script, and this one does not disappoint. Being the chief spokesman for Big Tobacco requires Naylor to be clever, often times to the point of trying to confuse whomever he is arguing with. The dialogue is swift and harsh, makes good use of cruel language, and doesn’t waste time pausing for petty laughs. The supporting cast is also stellar in my view, from Naylor’s son Joey, his business acquaintances Bobby (David Koechner) and Polly (Maria Bello), and the wildly stereotypical Vermont Senator Ortolan Finistirre (William H. Macy). Joey’s dialogue seems a bit beyond his age at times, but it adds to the film, so it’s an excusable mistake. Bobby and Polly are spokespeople for the firearms and alcohol industries, respectively, leading to amusing (and sometimes politically incorrect) conversations. Also, Sam Elliot (Narrator of The Big Lebowski), Rob Lowe, Robert Duvall, and Adam Brody all play small but entertaining roles in the film. The movie covers a difficult topic, and routinely washes levity over the subject of cigarette deaths in this country. Somehow though, it never comes out as just plain rude, but more of a societal commentary. You might be offended, you will almost certainly root for the “bad guy”, but I sincerely doubt you will be dissatisfied. It’s well worth the trip to the cinema; go see it.